I wanted to like Another Earth, I really did. I like the concept of an Earth doppleganger (people included) and the poetic possibilities that suggests. I love the good intentions behind a sci-fi film devoid of aliens, ray guns, space travel and all that other nonsense. I like that the filmmakers made a unique, technically impressive film for $200,000. I like co-writer / lead actress Brit Marling, who from the evidence has an exciting future ahead of her in both screenwriting and acting. And, most of all, I always like to cheer on the underdog from the sidelines. It is, then, with a note of genuine disappointment that I sadly admit my apathy towards the film. Things start well: very well in fact. The prologue is a vibrant, provocative piece of work - even the credits pulsate as our seventeen year-old protagonist Rhoda introduces herself and her worldview. It establishes a brave new cinematic tone, and I eagerly anticipated where the film would go as Rhoda stared out of her car window at a newly discovered distant planet. Then there's an 'unexpected' stealth car crash - one of cinema's most overused tricks in recent years, and a personal pet peeve - and my eager grin transformed into a frown. Early hints of a bold stylistic direction are all but abandoned thereafter. There are some gorgeous compositions scattered throughout - the frequent shots of Earth-2 hovering in the sky are certainly arresting - and some inventive editing slips in at random intervals. But these segments feel out-of-place with the grimy handheld cinematography - the kind you've seen in countless independent movies over the years - that comes to dominate the film. The story itself soon shoots off in directions that I can only describe as predictable. After the car accident, we're whisked four years into the future where Rhoda has just been released from prison as a result of her role in the accident. She chooses a janitorial job in a local high school as opposed to rebuilding her shattered dream of attending MIT. Racked with guilt and confusion, she drifts aimlessly from one day to the next. Eventually, she decides to attempt some sort of reconciliation with the sole other survivor of the accident (played by William Mapother, who it took me a frustrated half hour to recognise as the mysterious Ethan from Lost). Unable to bring herself to admit the truth, she lies about her identity and soon ends up trying to connect with her fellow lost soul. But we all know her big secret can't stay hidden forever. And therein lies my biggest problem with Another Earth. I always felt a few steps ahead of the writers and the characters. I'm not trying to sound pretentious or arrogant here - I honestly felt that every plot beat, character development or narrative twist was either excessively signposted or eerily familiar. In many ways, the narrative structure is reminiscent of a romantic comedy of all things. This is the traditional three-act structure in action: to a fault. Of course that particular storytelling standard is there for a well-established reason (it works, basically) - but Another Earth's consistent refusal to truly spread its wings was, in this writer's opinion, frustrating. The delivery is never less than competent, and there are a handful of moments and scenes that are genuinely poignant (Marling passionately retelling an old tale about a Russian cosmonaut nicely summarises the film's themes). Personally, however, the steadfast predictability consistently undermined any dramatic potential or tension. At very worst, it can feel preachy, sentimental, self-important and over-serious - only on a few occurrences, granted. Of course, Marling and her co-writer and director Mike Cahill do have that one big trick up their sleeve - Earth-2 (one clever exchange reflects on the human arrogance of determining the identical planet to be second best). There's so much inherent poetic possibility that the writers barely need to comment on it. They focus on one aspect - the possibility that the characters Earth-2 doubles may have had different experiences or made different decisions. It's a curious suggestion constantly burning away in the background, especially with the hints that the timelines of Earth-1 and 2 only deviated from each other on that fateful night four years previously. While the considered subtlety of the sci-fi elements is certainly to be admired, the problem is that it's perhaps too subtle. Blasphemy, you possibly yell - that understated sci-fi is, after all, what has helped Another Earth enjoy everything from hyperbolic enthusiasm to unconvincing vitriol. 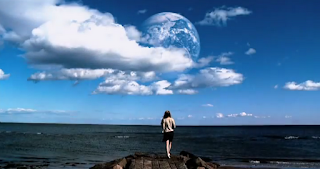 While Another Earth's occasional fixation with another Earth certainly provides a unique selling point, it ultimately feels overwhelmed by the core character study (which takes up a vast majority of the running time). It has the unfortunate side-effect of making the explicitly sci-fi scenes feel out of place and, dare I suggest, under-explored. What we're left with is a ho-hum indie drama on one hand and a half-baked arthouse sci-fi movie on the other. Combined, they certainly resonate with each other in curious ways, but it always feels as if there are many further insights that the film-makers are simply glossing over or outright ignoring. Comparisons with Solaris or the recent Melancholia are warranted, but Another Earth cowers beneath their powerful shadows. 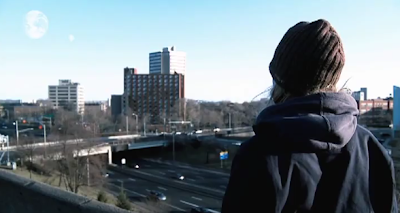 Like so many recent 'high concept' indie films, Another Earth ends ambiguously. The ending is actually well-considered in some ways, and open to many interpretations. But it's too little, too late, and a final example of an overall uncertain delivery and tone that holds the film as a whole back. The ambitions of Marling and Cahill can only be admired, and they have crafted an accomplished piece of work out of extremely limited resources. But it's because there's so much potential in Another Earth that the shortcomings feel so disappointing. Another Earth has a unique voice, but it's never allowed to sing.